Located in the heart of Paris, in a small cul-de-sac like a secret passage, the hotel Villa Boheme reveals itself with delicacy and charm. Fully refurbished in 2015, this 3-star boutique hotel offers a bright and colorful décor. Located between the Opera and Montmartre in the new district of 'South Pigalle', just a step away from Pigalles vibrant nightlife, the Villa Boheme is named after the very peculiar atmosphere of this district and its many emblematic places. The Villa Boheme Hotel offers you 24 cosy and very comfortable rooms offering absolute tranquility in the heart of Paris. The Villa Boheme offers you 24 Comfort double or twin rooms and Superior double or twin rooms in various colors in order to let you choose the atmosphere that suits you best. For your comfort, the rooms have double glazing windows, air conditioning, heating, flat-screen TV, DVD-player free Wi-Fi access, electric kettle, minibar and safe. The bathrooms include a shower, a hairdryer, bath towels and bathrobes, and welcome products. Comfort double or twin rooms: 1 double bed of 1.60 m or 2 single beds. Located at the back of our hotel, they offer absolute calm in the heart of Paris. Superior double or twin rooms: 1 double bed of 1.60 m or 2 single beds. Located on the front of the hotel, they enjoy continuous sunshine and offer you an unobstructed view of the private cul-de-sac. The Villa Boheme is located not far from the'Eglise de la Trinité' church and the famous Parisian departments stores Le Printemps and Galeries Lafayette. 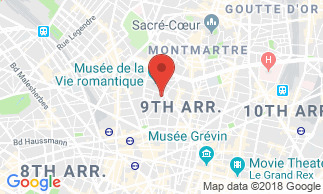 The Moulin Rouge cabaret and the Montmartre district are also just minutes away. During the day, you can shop in the many shops and boutiques of the neighborhood, or enjoy the small restaurants and large 'brasseries', cheerful bars,... Nearby are also the Musée de la Vie Romantique (Museum of the Romatic Life), the Espace Dali and the Gustave Moreau Museum. In the evening, it is showtime in the many theatres, cabarets and concert halls near the hotel: the Theatre Fontaine, the Theatre de Paris, Comedie de Paris, Theatre de Dix Heures, the Theatre Saint-Georges, la Nouvelle Eve, the Moulin Rouge, Les Trois Baudets, the Carrousel de Paris or, just a little further, the Manufacture des Abbesses and La Cigale. - Fruit juice, squeezed orange juice, coffee machines, teas, chocolates, cappuccino, espresso, etc.